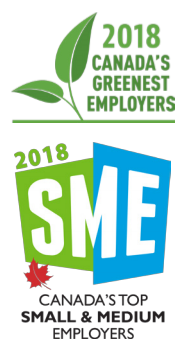 Victoria, BC, Canada – Reliable Controls is pleased to announce that the company is the recipient of two employer awards through Canada’s Top Small & Medium Employers and Canada’s Greenest Employers, competitions that are evaluated by the editors at Canada’s Top 100 Employers. Reliable Controls received both Top Employer and Greenest Employer awards. Now in its 5th year, Canada’s Top Small & Medium Employers is an editorial competition that recognizes the small and medium enterprises (SMEs) with the nation’s best workplaces and forward-thinking human resources policies. Employers are compared to other organizations in their industry to determine which offer the most progressive and forward-thinking programs. The annual competition is open to any employer with its head office or principle place of business in Canada. Employers must have less than 500 employees worldwide, including employees at affiliates, and be a commercial, forprofit enterprise. Reliable Controls supports ongoing employee education with tuition subsidies for courses directly and indirectly related to an employees’ role, up to $2,000 per year. Along with helping employees save for the future, Reliable Controls Corporation offers phased-in work options to help those nearing retirement make the transition. Reliable Controls Corporation supports local and national charitable organizations each year and encourages employees to give back with paid time off to volunteer and matching employee donations. Now in its 11th year, Canada’s Greenest Employers is an editorial competition that recognizes employers that lead the nation in creating a culture of environmental awareness. In keeping with its line of business, Reliable Controls Corporation’s head office is a LEED® Platinum certified building with many impressive green features, including a storm water management system that directs water to a series of vegetated bioswales and rain gardens, unique daylight harvesting controls to enhance lighting, and use of collected rainwater for toilet flushing. In support of the annual Bike to Work Week, Reliable Controls Corporation employees volunteer to host a bicycle repair clinic one week prior to the event and offers free diagnostics and tune-ups to help colleagues prepare for the week - the company also encourages non-cycling employees to participate with raffles and prizes for the top three riders who cycle the greatest distances.